From tare entry to counting to setpoint outputs, the 420 Plus is the ideal choice for any industrial weighing application. A full numeric keypad allows tare entry directly from the keypad for weighing the contents of totes, cylinders, and containers, eliminating the need to scroll and toggle tare weight values. A count mode allows keyed piece count and APW (average piece weight). Two front panel accessible, free-running setpoints activate lights or buzzers. 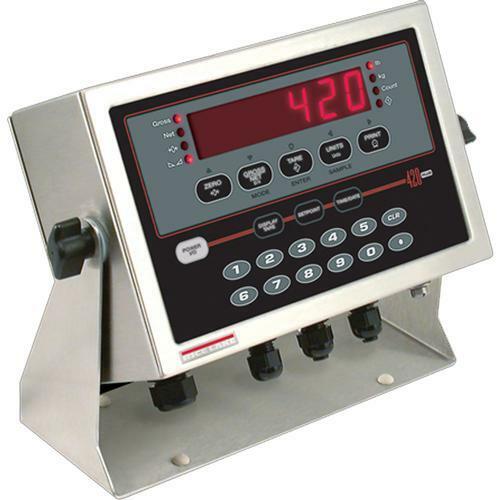 Optional DC capability makes the 420 plus an ideal instrument for onboard weighing. Time and date are easily set from the front panel to display and print on a transaction ticket. The 420 Plus is encased in a tough, all stainless steel NEMA Type 4X/IP66 enclosure for extra-long life, even in the harshest conditions. The ultra-bright, oversized display reduces operator error and accelerates productivity. Fully interactive, the 420 Plus features two independent communication ports for complete EDP and print ticket programmability. It easily programs two formats with up to 300 characters, allowing you to create complex custom tickets.